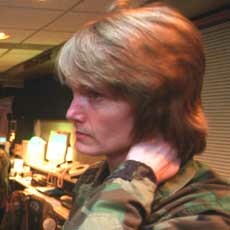 Lt. Col. Dawne Deskins. [Source: Newhouse News/ Peter Chen/ Landov]Members of staff at NORAD’s Northeast Air Defense Sector (NEADS) have difficulty locating Flight 11 and other aircraft on their radar screens. The emblem of the 177th Fighter Wing. [Source: United States Air Force]Colin Scoggins, the military liaison at the FAA’s Boston Center, calls NORAD’s Northeast Air Defense Sector (NEADS) and suggests that it contact a military unit at Atlantic City, New Jersey. However, when NEADS tries phoning the unit, the call is not answered. 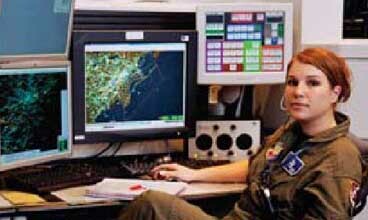 An air traffic controller at the FAA’s Boston Center directs the two fighter jets that took off from Otis Air National Guard Base in response to the hijacked Flight 11 toward a new heading, based on instructions he has just received from NORAD’s Northeast Air Defense Sector (NEADS). 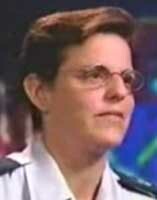 Master Sergeant Maureen Dooley. [Source: ABC News]Rumors have started circulating through the civilian air traffic system that the plane that hit the World Trade Center was a small Cessna. There is increasing confusion on the operations floor at NORAD’s Northeast Air Defense Sector (NEADS) as to whether it was really Flight 11. ID tech Stacia Rountree is on the phone with Colin Scoggins, a civilian manager who is the military liaison at the FAA’s Boston Center. 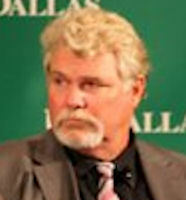 Scoggins initially seems to confirm that the plane was Flight 11, saying: “Yeah, he crashed into the World Trade Center.… [D]isregard the tail number [given earlier for American 11].” When Rountree asks, “He did crash into the World Trade Center?” Scoggins replies, “[T]hat’s what we believe, yes.” However, an unidentified male staff member at NEADS overhears, and queries: “I never heard them say American Airlines Flight 11 hit the World Trade Center. 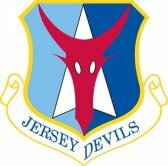 I heard it was a civilian aircraft.” Master Sergeant Maureen Dooley takes the phone from Rountree and asks Scoggins, “[A]re you giving confirmation that American 11 was the one?” Apparently contradicting what he’d previously said, Scoggins replies: “No, we’re not gonna confirm that at this time. We just know an aircraft crashed in.… The last [radar sighting] we have was about 15 miles east of JFK [International Airport in New York City], or eight miles east of JFK was our last primary hit. He did slow down in speed… and then we lost ‘em.” [Vanity Fair, 8/1/2006] This confusion will continue later on, when NEADS will be misinformed that Flight 11 is still airborne (see 9:21 a.m. September 11, 2001). According to the 9/11 Commission, NEADS is contacted by the FAA’s Boston Center. Colin Scoggins, Boston Center’s military liaison, tells it: “I just had a report that American 11 is still in the air, and it’s on its way towards—heading towards Washington.… That was another—it was evidently another aircraft that hit the tower. That’s the latest report we have.… I’m going to try to confirm an ID for you, but I would assume he’s somewhere over, uh, either New Jersey or somewhere further south.” The NEADS official asks: “He—American 11 is a hijack?… And he’s heading into Washington?” Scoggins answers yes both times and adds, “This could be a third aircraft.” Somehow Boston Center has been told by FAA headquarters that Flight 11 is still airborne, but the 9/11 Commission will say it hasn’t been able to find where this mistaken information came from. Colin Scoggins, the military liaison at the FAA’s Boston Center, calls NORAD’s Northeast Air Defense Sector (NEADS) to report a low-flying airliner he has spotted six miles southeast of the White House. He can offer no details regarding its identity. The plane is reportedly Flight 77, but as it has its transponder turned off, no one realizes this at the time. The news of the plane “sets off a frenzy.” Major Kevin Nasypany orders Major James Fox, head of the NEADS weapons team, “Get your fighters there as soon as possible!” Staff Sergeant William Huckabone says, “Ma’am, we are going AFIO [emergency military control of the fighters] right now with Quit 2-5 [the Langley Air Force Base fighters]” (see 9:36 a.m. September 11, 2001), and adds, “They are going direct Washington.” [Vanity Fair, 8/1/2006] The Langley fighters will arrive over Washington some time around 10 a.m. (see (Between 9:49 a.m. and 11:00 a.m.) September 11, 2001). An air traffic controller at the FAA’s Boston Center is concerned about an unidentified aircraft flying in from the east, approaching Cape Cod. Colin Scoggins, the military liaison at the Boston Center in Nashua, New Hampshire, has noticed the large, slow-moving target on his radar screen. It is just off the coast and heading directly for Boston. Concerned as to what the aircraft is, he phones the Fleet Area Control and Surveillance Facility in Virginia Beach, Virginia. [Spencer, 2008, pp. 242] The facility, known by its call sign, “Giant Killer,” is the Navy air traffic control agency that handles all over-water military operations. [New York Times, 2/10/1997; Spencer, 2008, pp. 143] Scoggins says: “We have a large, slow-moving target approaching Cape Cod and heading for Boston. Do you have it? What is it?” The person at Giant Killer only replies, “We’re looking,” and then mentions, “We’ve got a fleet of ships heading toward the northeast and an Aegis cruiser [a high-tech warship] on the way.” Scoggins is worried that Giant Killer is unable to specifically identify the target he is seeing on his radar screen. It appears to be flying straight toward the Boston Center. He thinks to himself, “If I wanted to use airliners to attack a country, I would take out their air traffic control facilities!” Scoggins continues watching the suspicious aircraft on his radar screen. Shortly afterward, the Boston Center will be evacuated after the FAA’s New England regional office calls it and reports an unidentified aircraft heading toward the facility (see (Shortly After 10:20 a.m.) September 11, 2001). [Spencer, 2008, pp. 242-243] This is apparently a different aircraft to the one Scoggins is tracking. [Federal Aviation Administration, 9/20/2001; Federal Aviation Administration, 3/21/2002 ] Whether the plane Scoggins is tracking is ever identified is unclear. The FAA’s Boston Center is evacuated after it receives a report that an unidentified aircraft is heading its way. [Federal Aviation Administration, 9/20/2001; USA Today, 8/11/2002; New Hampshire Union Leader, 9/11/2006; Spencer, 2008, pp. 243] The Boston Center, located in Nashua, New Hampshire, manages air traffic above New England, and monitored Flight 11 and Flight 175 earlier on. [USA Today, 8/11/2002; Associated Press, 8/12/2002] Employees there are already concerned because a large tractor-trailer has parked directly in front of their facility, on New Hampshire’s Route 3. State police have been called to get it away from there. Bomb Threat to Childcare Facility - Making matters worse, a bomb scare phone call is received at the center’s childcare facility, which is the employees’ usual evacuation point. Center managers therefore decide that everyone must leave the building. Employees are advised to go to either 11 Murphy Drive—an FAA administrative facility—or a nearby Holiday Inn. According to Scoggins, three or four Flight Service Data Processing System personnel remain in the basement of the Boston Center when it is evacuated, apparently because there is no paging system in their office on which they can receive the evacuation order. Suspicious Aircraft Only a Coast Guard Plane - As it turns out, the approaching aircraft that prompts the evacuation is just a Coast Guard plane. According to Scoggins, “We had already identified it.” [Federal Aviation Administration, 9/20/2001] The aircraft was noted in a 10:18 a.m. entry in the log of the FAA headquarters’ teleconference, which stated: “Aircraft 160 miles east of Nantucket is headed westbound toward Boston at a high rate of speed.” But a log entry five minutes later, at 10:23 a.m., noted that the aircraft “is identified as a Coast Guard flight from Nantucket.” [Federal Aviation Administration, 3/21/2002 ] Shortly before the Boston Center is alerted to this aircraft, Scoggins had been tracking what is apparently another unidentified target on his radar screen: a slow-moving large aircraft that is also flying toward the Boston Center from the east (see (10:20 a.m.) September 11, 2001). [Spencer, 2008, pp. 242-243] The identity of that aircraft is unclear. The Moncton Area Control Center. [Source: Nav Canada]Colin Scoggins, the military liaison at the FAA’s Boston Center, contacts NORAD’s Northeast Air Defense Sector (NEADS) and a Canadian air traffic control facility, to let them know that the Boston Center is shutting down its airspace and being evacuated, due to a possible airborne threat. Scoggins Does Not Immediately Evacuate - The Boston Center in Nashua, New Hampshire, has just received a call from the FAA’s New England regional office, alerting it to an unidentified aircraft heading its way. In response, the center’s managers ordered the evacuation of the facility (see (Shortly After 10:20 a.m.) September 11, 2001) and declared “ATC zero,” which completely shuts down the center’s airspace (see (Shortly After 10:20 a.m.) September 11, 2001). But while others leave the building, Scoggins stays behind to make two phone calls. Scoggins Calls Canadian Facility and NEADS - His first call is to the Moncton Center, which is the Canadian air traffic control facility that handles flights arriving from over the Atlantic. He tells a supervisor there, “We’re going to ATC zero and evacuating.” Scoggins then calls NEADS with the same information. He says: “I wanted to let you know, Boston Center has declared ATC zero and we are evacuating due to an airborne threat. It’s approaching Martha’s Vineyard and it’s coming our way.” Before hanging up, he gives NEADS the speed and coordinates of the approaching aircraft. Scoggins then heads out of the building. According to the account of author Lynn Spencer, Scoggins’s call prompts NEADS to immediately call Otis Air National Guard Base in Cape Cod, Massachusetts, and order it: “Get everything you’ve got in the air! Now!” (see (10:20 a.m.) September 11, 2001).